The National Institute for Digital Learning (NIDL) at Dublin City University, the Irish Learning Technology Association (ILTA), and the New Media Consortium (NMC) have launched a collaboration to conduct research and publish a regional analysis that describes the emerging technologies, trends, and challenges that will impact higher education in Ireland. 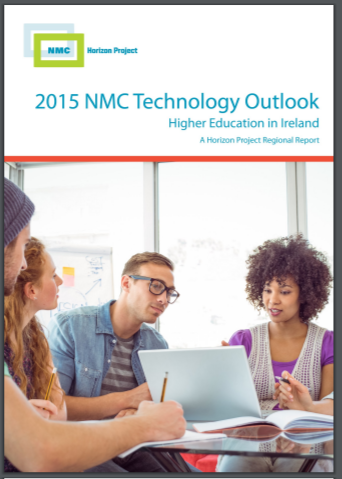 The first ever NMC Horizon Project Ireland will produce the 2015 NMC Technology Outlook > Ireland Higher Education, which will be released in March 2015 and jointly distributed free-of-charge, under a Creative Commons license. With Dublin-based industry giants such as Google, Apple, Microsoft, LinkedIn, and Houghton Mifflin-Harcourt enhancing Ireland’s reputation as the “Silicon Valley of Europe”, the 2015 NMC Technology Outlook > Ireland Higher Education will highlight technological advances in third level education in Ireland. The NIDL, ILTA, and NMC have forged this relationship on their shared mission of integrating modern approaches and technologies into teaching and learning. Upon its release, the 2015 NMC Technology Outlook > Ireland Higher Education will become a foundation of research that supports education transformation throughout Ireland. The report will apply the process developed for the NMC Horizon Project, with a focus on identifying and describing emerging technologies likely to have an impact on teaching, learning, and creative inquiry in universities and colleges across Ireland. Beginning in November 2014, an expert panel of leaders in Irish third-level education will engage in discussions in a collaborative, virtual workspace to determine the top 12 developments in educational technology, along with nine key trends and nine significant challenges that will have the deepest impact on teaching, learning, and creative inquiry over the next five years. These 30 topics will then be further researched and detailed with in-practice examples from Irish institutions and educational programs in the 2015 NMC Technology Outlook > Ireland Higher Education. To view the expert panel’s progress throughout the project, visit http://ireland.wiki.nmc.org/.